Designed especially for the delicate zone around the eye. This cream hydrates and soothes the skin while leaving it appearing young and vital. The rose oil contained in the cream has nourishing effect and helps reduce the depth of wrinkles. The cream contains hyaluronic acid which provides optimal hydration of the skin, restoring it's elasticity, resulting in smoother and softer skin in the delicate eye zone. 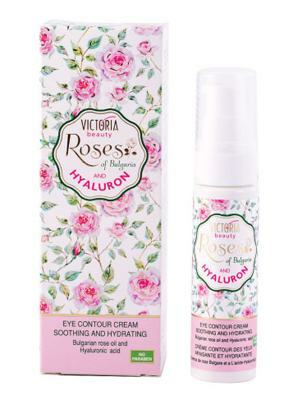 For better effect use in combination with the rest of the products from Victoria Beauty Roses of Bulgaria series. Gently apply morning and evening around the eyes.